Instant adhesion with excellent holding power. Ideal for basic taping jobs around the house. Crystal clear with a classic glossy-finish tape. 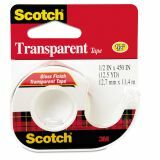 Scotch Transparent Tape in Hand Dispenser, 1/2" x 450", 1" Core, Clear - Scotch Transparent Office Tape is a glossy tape with a high-clarity finish. Instant adhesion with excellent holding power. Long-aging, moisture-resistant and stain-resistant tape is clear when applied and does not yellow. Pulls off the roll smoothly and cuts easily.  Ideal for multipurpose sealing, label protection, general purpose wrapping, and mending. Tape comes in a handheld dispenser. Dispenser included: refills easily, stores away conveniently, always ready. Makes a great complement to decorative gift-wrapping paper. Easy-to-apply design that doesn't dry out or yellow.